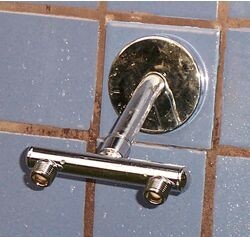 Fits a standard shower pipe to allow you to place 2 shower heads on the same pipe. Openings are 4" on center. Solid brass construction. Add a couple of flow controls to be able to turn on and off the individual shower heads and control water volume.